He's so miserly, he won't buy a comb for the office!? What's your favorite filmed adaptation of the Dickens' book 'A Christmas Carol?' Most critics quibble between the 1951 version starring Alastair Sim and the 1984 version with George C. Scott. But viewers' favorites usually depend upon which version they grew up watching. The 1935 version entitled Scrooge starring Seymour Hicks has become more popular in recent years. For decades it was ignored by broadcasters who preferred to air either the 1938 or the 1951 versions on television. The former is a theatrical release with Reginald Owen playing Scrooge. This version was known as the first Hollywood adaptation of Dickens' book. The 1951 Sim version replaced the earlier American version on television. But in the last handful of years, the 1935 version has also become easy to find on TV schedules each December. 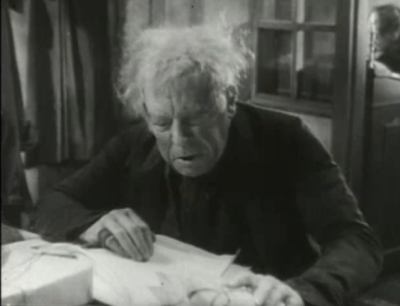 The actor Seymour Hicks who portrays Ebenezer Scrooge in the 1935 version had performed the role many times before--on the stage as well as in an early silent film version. In fact, this 1935 version is the first feature-length filmed adaptation produced with sound. Over the years, this film like many others, has suffered from being edited and cut down, running as short as 60 minutes. However in the last few years, the uncut 78 minute full length version has become easily accessible for viewing. ~~there are several minutes of footage from scenes of Christmas morning missing including Scrooge shaving, going to the poulterer’s shop, snow falling on his head, meeting up with the charity collectors and Scrooge joining the Cratchit family at church. These above moments collectively amount to seventeen minutes of footage cut out. That's quite significant considering how popular and well-known this story is to the average viewer. However, the 1935 version has its own distinctive style of storytelling and contains scenes not seen in other versions. One such is the depiction of how Scrooge spends his Christmas Eve. In this scene, he is seen alone, patronizing a very simple tavern for his evening meal that is cross-cut with a very lavish holiday party and dinner for London’s wealthiest residents. In another, the ghost of Jacob Marley is invisible and only heard by Scrooge. Another is that the Ghost of Christmas Past is seen as an ethereal spirit, a stylized special effect rather than a traditional actor in a costume. Similarly, the Ghost of Christmas Future is depicted merely as a shadow. Ebenezer has visions of his Christmases past but doesn’t physically journey to the past as he does in most other filmed versions. Scrooge’s past does not include visions of his school days and his sister Fan as it does in the original book. Rather, Scrooge's visions of his past begin with Belle ending their engagement. And, on Christmas morning, the charwoman brings Scrooge his breakfast and his excited behavior causes her to fear he’s gone mad. This scene is not in the original book. Neither is the final scene of the movie where Scrooge joins the Cratchit family at church. TRIVIA: the great Shakespearean actor Maurice Evans appears in the small role of a poor man requesting an extension on his debt during Scrooge’s vision of his Christmas Past. TV junkies may recognize Evans as the actor who played Samantha's father on the 1960s TV series Bewitched. Of course, watch the 1935 version yourself. Let me know what you think. Below is the uncut, full length unedited version. Or, you can watch it at Archive.org. Hello, I have started a new TV/Movie blog. Please follow me! Thanks for invite Whitney--what's the link? blog name?